In the laboratory of McGowan Institute for Regenerative Medicine affiliated faculty member Prashant Kumta, PhD, the Edward R. Weidlein Chair Professor at the University of Pittsburgh Swanson School of Engineering and School of Dental Medicine and professor in the Departments of BioEngineering, Chemical and Petroleum Engineering, Mechanical Engineering and Materials Science, and Oral Biology, one of the visions is to revolutionize metallic biomaterials and technologies to create life changing devices. This will lead to engineered systems that will interface with the human body to prolong and improve quality of life, specifically with craniofacial and orthopedic applications. Dr. Kumta and his team’s goal is to engineer logical and clinically relevant options that could regenerate mineralized tissue (bone/tooth) formation utilizing a unique combination of evolutionary load-bearing biodegradable materials (metals), growth factors, and cell therapy. Recently, Rosanne Skirble of Voice of America News reported (video here) that Dr. Kumta and his team of graduate students are designing 3D-printed materials that are a match for the patient’s body, and are absorbed or excreted as new tissue grows and the wound heals. In the laboratory, Dr. Kumta’s team has developed both magnesium and iron alloys to use as the materials’ base. He calls magnesium — a mineral needed for more than 300 biochemical reactions in the body — “a perfect fit” for the technique. “It has the mechanical characteristics that meet natural bone, both from the strength [and] the toughness as well as the density. It has the perfect density that will match with natural bone,” he said. 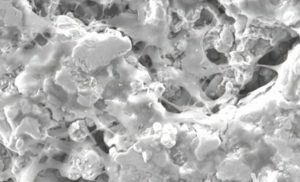 Dr. Kumta’s team is also working with a novel formulation of calcium phosphate putty that can be injected to fill spaces between fractured bones. A 3D-printed biodegradable plate or screw would hold that filler in place. 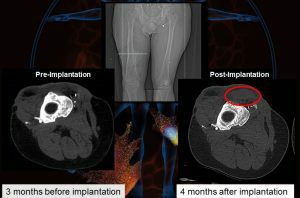 “The fixation plate will provide the mechanical strength needed to carry the load, and the bone-wide filler would help provide the healing and the bone formation,” he said. Pre-clinical trials are now underway in animals. Dr. Kumta said the work is revolutionary, offering the prospect of a better outcome for the patient. A new preservation system has been developed that pumps cooled, oxygen-rich fluid into donor livers not only keeps the organs in excellent condition for as long as 9 hours before transplantation, but also leads to dramatically better liver function. This system offers the potential to increase the survival of liver transplant recipients, according to a series of preclinical studies by researchers at the University of Pittsburgh School of Medicine and the McGowan Institute for Regenerative Medicine. The system could be tested with transplant patients at UPMC later this year. The findings, which were published online in the American Journal of Transplantation, suggest that it’s possible to use the technique of “machine perfusion” with a newly created cell-free oxygenated solution to expand the number of high-quality livers available for transplant, thereby shortening waiting times and reducing patient mortality. Currently, 20 to 40 percent of donor livers cannot be transplanted into recipients because oxygen deprivation during storage and transport in conventional containers can make pre-existing tissue damage worse, explained senior investigator Paulo Fontes, M.D., UPMC transplant surgeon, associate professor, Starzl Transplantation Institute, Department of Surgery, Pitt School of Medicine, and a deputy director of the McGowan Institute. If the damage is too extensive, the organ cannot be safely transplanted into a patient. The research team optimized a machine-perfusion (MP) device that was developed by Organ Assist, a company in the Netherlands, and added a fluid with a hemoglobin-oxygen carrier component to deliver high concentrations of oxygen to the tissue. The liver is immersed in chilled fluid, which is also pumped through tubes inserted into the organ’s large blood vessels to effectively oxygenate the tissue. The team transplanted six pigs with livers that had been kept for 9 hours, roughly the average time between recovery of the organ and transplantation into a recipient, in the MP system and another six with organs placed in the standard container. They found that 100 percent of the pigs who got MP livers survived, compared to 33 percent of those who received conventionally preserved organs. The MP livers functioned better, produced more bile, and had higher oxygen levels than their conventional counterparts, and analyses of multiple biomarkers including inflammatory mediators indicated that the MP livers had been better preserved. The data from the studies have been shared with federal regulators, he added, with the aim of launching a clinical trial to test the system at UPMC this year. Co-investigators include Roberto Lopez, M.D., Yoram Vodovotz, Ph.D., Ruben Zamora, Ph.D., Donna Stolz, Ph.D., Anthony Demetris, M.D., George Michalopoulos, M.D., Ph.D. (all McGowan affiliated faculty members of the McGowan Institute for Regenerative Medicine), Marta Minervini, Ph.D., Victor Scott, M.D., Kyle Soltys, M.D., Sruti Shiva, Ph.D., Shirish Paranjpe, Ph.D., David Sadowsky, Derek Barclay, and James Wallis Marsh, M.D., all of the University of Pittsburgh; and Arjan van der Plaats, Ph.D., of Organ Assist, Groningen, Netherlands. Three of the five patients have shown a 20% or greater improvement in strength of the injured leg. The results haven’t only shown dramatic improvement on physical tests. The participants are now engaging in a range of activities including running, bicycling, playing soccer, and even skiing—activities they couldn’t enjoy before their surgery.